Despite having read numerous reviews citing problems with packaging and mirrors arriving damaged, I took a leap and ordered this mirror and am thrilled I did! It was packaged incredibly well with loads of insulation and arrived perfectly. The photos don’t do the mirror justice... it is even better looking in person, very sturdy, beautiful carved detailing on the wood frame and will look incredible in my master bath. It is quite heavy and will require two people to hang. If you are at all concerned about ordering a mirror online , worry no more! 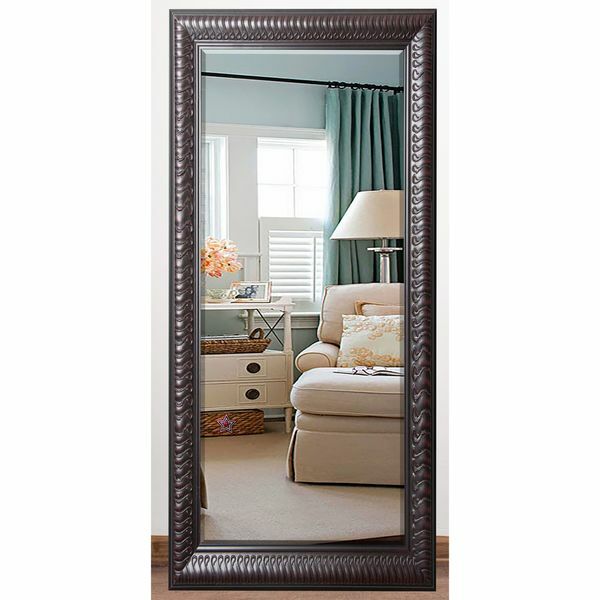 This stately full-length wall or floor mirror represents dignity and prestige. The frame is finished in an enchanting rich dark mahogany, with exquisite royal curve detailing. These features come together, with the beveled mirror, to produce a distinctive design that is sure to make a stylish statement in your home. Product options: R046BT: 26.5 x 60 (interior), 32 x 65.5 (exterior). R046BXT: 25 x 65.5 (interior), 30.5 x 71 (exterior). Frame dimensions: Frame Depth: 1 inch. Frame Width: 3 inches. Dimensions 30.5 In. X 1.0 In. X 71.0 In.